Although there are many homes throughout the world that have clean, fresh water, in such a way that this is a normal occurrence; in other homes, this is a very limited resource. 18% of the world’s population does not have access to safe sources of drinking water and people lack adequate sanitation methods. It’s a worldwide issue, as the lack of water is something that affects both the rich and the poor. It’s a problem that demands further awareness and remediation. A group of Mexican young people are very familiar with this problem, and above all, of how it truly affects their country. With a main focus of social work, “creating a movement”, as Nabani has explained to us so well during an interview regarding Isla Urbana. They attack the problem with the help of a rainwater collection system, a system that is being implemented step by step in concrete zones in Mexico, with fantastic results. Nabani, can you tell us what Isla Urbana is and what you do? Nabani: Isla Urbana is a social project, and we are dedicated to the design and installation of rainwater collection systems, a sustainable answer to the water problem. It started as a social project that has advanced with time, and is turning into a business as well. You have received several prizes and acknowledgements, such as 1st place in the Youth Prize by the Mexico CIty Government, what did you do to earn these awards? Nabani: We have received several prizes, some such as the UN Water on a global scale, and among the most important was one from MIT which recognized 35 Innovators under 35 years old within Mexico. Mainly what has been recognized is that our system works very well. The rainwater is collected through a low-cost system that does not require electricity. This gives it the great potential to become very efficient eco-technology that can be used to help solve one of the most important problems that our planet is facing, which is the issue of water. Nabani: There are many projects that are dedicated to developing eco-technologies, so in that sense we are sister projects. That we are very similar in our efforts to form a better world. Particularly, some friends of ours are dedicated to generating energy through the use of fertilizers (animal waste). But as far as rainwater collection, there aren’t other social projects. We are a business and we are interested in creating economic sustainability because we want to live off of our work. Nevertheless, our priority is not to have a business that grows and that sells the systems and expands everywhere. Our focus is to design and create rainwater collection systems that anyone can have access to. We are much more interested in the installation aspects, and the purchase of rainwater collection systems. That’s partly related to promoting awareness, as this water issue is something that affects everyone. It doesn’t matter how little resources you have or how much money is available, water can run out for all of us just the same. If we only focus on the sales, we are leaving a lot of things to the side, that are important to us to discuss. There’s a part of it regarding making money and living off of it; but there’s another part that answers more profound interests than this. The money side resolves important needs; but the other side is that there is a need for a solution to this grave problem that exists regarding water. And past being a solution, we are managing to interest people in ecological issues and we are able to empower the citizens. Something that makes us different is that we are not simply focused on selling to the client, but that we want to create a movement through our project. We want people to feel that they have control over the quality of the water that they drink, the quality of the water that they give their children. It’s a social background in which we want to work as well as communicate. And speaking about the social focus, you have certain projects in specific communities? Nabani: Yes, we are mainly focused on two separate projects. One of them (the most important and with the most volume) is located on the south side of Mexico City, in the upper regions. In Ajusco, the area that leads to Cuernavaca, all of the villages that are above Tlalpan and Xochimilco. All of the houses that are located above there that don’t have any connection to the system, in other words, that water doesn’t come out of the faucet for them. They are the ones that only receive water through the tanker trucks. This presents a grave problem on all sides. On one side, it’s very expensive for the government to send out the trucks to these areas; they spend a lot on gasoline, as well as drivers. On the other side, these trucks generate a lot of contamination, as they are old and are not in good shape, which generates large quantities of CO2 (major contaminate). And on the other side, families sometimes have to wait between two weeks and a month for water to get to them. Families are in charge of delegating it, but the waiting lists are very long (before they had to start at 3 am). They are places where the people don’t have resources, we are interested in taking our systems to these areas facing these issues, and bettering the situation. We work towards focusing all of our efforts on the same point. To be able to see, measure and show the impact of our system; if this was with varying focuses and various locations, it would be much more difficult to control. Our intention is to reach 10,000 installations of our system in this area. Right now, we have over 2,000 and we are projecting 3,500 will be in place this year. Right now our objective is the upper south area of Mexico City so that they can live off of the rainwater collection and the Government can see that and say: Oh! The people are living off of rainwater there, let’s take that seriously. Another important project that we have in place is in Sierra Huichol with the indigenous group of the Wixárikas. We work within the state of Jalisco and Nayarit and in the mountainous area but not the desert. We have been working with them for approximately 6 years at a slow and steady rate, to put it one way. It has been a slow process due to the conditions that are involved with working with this indigenous group. But we are seeing results that are just as good if not better. People here had to go and get their water from the river two or three times a day and walk 1 to 2 kilometers carrying 20 to 40 liters. This task was supposedly the women’s job, because it is considered a home duty. We saw that they had a minimal amount of water available for the children, which led to eye infections, skin infections, and even infections on their stomachs; and the women had back problems. But the systems have had great results. The people there have been practically living for a year off of the rainwater, which is very clean. It’s cleaner than the water that falls in the city as it’s not as contaminated. In rainy season, what is used during the day (even if there is waste), fills back up during the night. In dry season, they use the stored rainwater (it can reach up to 15,000 liters of stored rainwater). Alright, and in regards to the company, you sell these water retention systems. How do you obtain clients? Nabani: The business side has been very natural, we haven’t invested even one peso in publicity. All of it has been very organic, and as the project is very interesting, we have reporters come to us all the time that want to get to know our project and to see what we are doing. So what else is there to say other than that they come, they arrive by themselves. People see and understand the problem that exists with rainwater collection. Our main objective is to promote rainwater collection within Mexico City and throughout the country as a whole. If we can accomplish that through the civil association, we’ll go ahead in that direction. But we are realizing that the business aspect is also necessary to make our project effective. It supports us so we can cover expenses, but there are also people that say that they have the money to pay for them. The systems are not very expensive; in fact, the profits we receive from our sales are not that high. We don’t want to turn into a business that solely prioritizes 100% annual growth. What we are genuinely interested in is seeing how many systems we have installed, how many liters they are able to collect, how much water is being stored in the aquifer, etc. In that sense, the clients come to us because they have read about us in magazines, and social media (because we share our content). But let’s not forget that we are looking to upgrade the kits that we sell, giving those individuals that come to us and tell us about where they live, more options. Furthermore, if a rainwater collection system is not convenient for them, we also have other water saving options or dosing. It has been a very natural and beautiful process, because clients come to us as people have grown consciousness regarding this issue, sometimes through information that they have given us; or sometimes through their own deduction process. Individuals are able to add on to the project, it doesn’t matter where they’re from, but that they are able to help this movement forward by creating further awareness around them, and knowing how to take advantage of what nature has given us. I see that you have a strong social media presence. How important are these outlets for Isla Urbana and which one works best for you? Nabani: For us, they are extremely important. A project like ours that doesn’t have access to mass means of communication; except for reports that we have participated in. But in the end, they aren’t in our control, we can’t say what we want to say in front of the camera; and the channel is going to edit it, and is going to place what they want. Social media networks are the revolution of this age. You can get directly in contact with people, and this is very important to be able to talk to and clarify, as many times as necessary, what rainwater collection is all about. We see it as a labor of explanation, as there are people continually writing us to get to know and understand what this system is about. For each person that is asking us something, we answer them as though it was the first time talking about this subject, explaining it to your mother. That’s to say, we discuss it with patience and interest in ensuring that you understand, and that we are able to take care of any concerns that you may have. They are a very dynamic means to express the essence of your project. If you see what we have on our social media accounts, in reality, we are expressing who we are; a group of young, entrepreneurial Mexicans, that have a good time, and are concerned about the environment on a global scale but maintain a positive outlook. Social media allows us to communicate with others, in a very complete and sensible way, regarding the intentions that rule our actions. This year, we have placed an intense focus on the communication aspect of this endeavor. As it happens, within social media you can easily find great quantities of information, so what we are concerned with is filling our space with content that generates something relevant, and that presents a clear objective. We want to focus on our followers and on having high-quality content, more than quantity. The quantity will come with constant work, trying to be creative and forgetting the clear transmission of the message we want to send; followers will come on their own, one way or another. What other strategies, speaking of the business aspect, do you use to retain clients? Nabani: We are interested in constantly providing new information; in other words, that the public is able to come and get to know, as well as understand the rainwater collection system as a first step. We spend our time doing studies on the quality of the water, the rain, and working on the components of our systems with academic institutions such as UNAM. We look for our clients, giving them information that we generate regarding the rainwater collection, since it is an idea that generates a movement and a change of consciousness. Establishing a relationship and a dialogue through social media networks is important, as there are so many people that reach out to us through them. We are able to write people that have our systems installed to answer any questions or doubts that they may have, as well as to ask them how the systems are working. What advice could you give another startup that is within its beginning stages? Nabani: What I’ve seen is that there are many startup projects here in Mexico, as well as many within Latin America, that try to follow ideals that are inspired within a system or a model very similar to the ones seen in the United States. There was a boom in apps, and many young people in Mexico City started to think that they had to create apps for everything, because if people used it they would be millionaires in a second. I don’t think that it’s a bad idea to enter into the world of apps and technology. But it can be done from another focus point, and it can be used to solve local needs, including more pressing issues. Focus your efforts, your talents and your creativity on things that could be more useful for someone else. In fact, if you look at it from an economic perspective, those who make up the section of the market that have less resources is larger than the market group that has more money available. If you focus your business on the base of the marketing pyramid, if you are able to reach this sector, you’ll see much better results as there is much more competition between individuals to create apps, and other items for people with money. Particularly in Mexico, if you try to compete fairly against Silicon Valley in terms of technology, we are light years behind. It’s like starting a marathon with someone who has more experience, but you have to be smart about the situation. If you want to compete against someone that is already doing something, and is doing it better than you, it’s about a strategical error. I recommend focusing on local issues, instead of imitating others, and to create your own identity. As youth, we are also a creative force behind important work, as we are focusing our efforts on our country. I would recommend that you view failures as a part of success. Here in Mexico, failure is something that is seen as the worst thing that can happen and you stay there, only seeing how down you are and you give up. But I have learned from this project that failures and errors are an essential part of the process, and that without them you won’t reach true success in anything. The exercise that I do, and that I invite people to do, is to imagine that money didn’t exist. Imagine that nobody has more money than anybody else, or that the whole world has a lot of money, what would you do?. With this exercise, you can identify if what you are doing answers this question. Work, work as a team, and you’ll fail but what’s important is that you enjoy the process. There will be happy moments and moments where you feel sad and discouraged. But you need to find happiness in the everyday and in the enthusiasm of your venture, as well as in your own work. 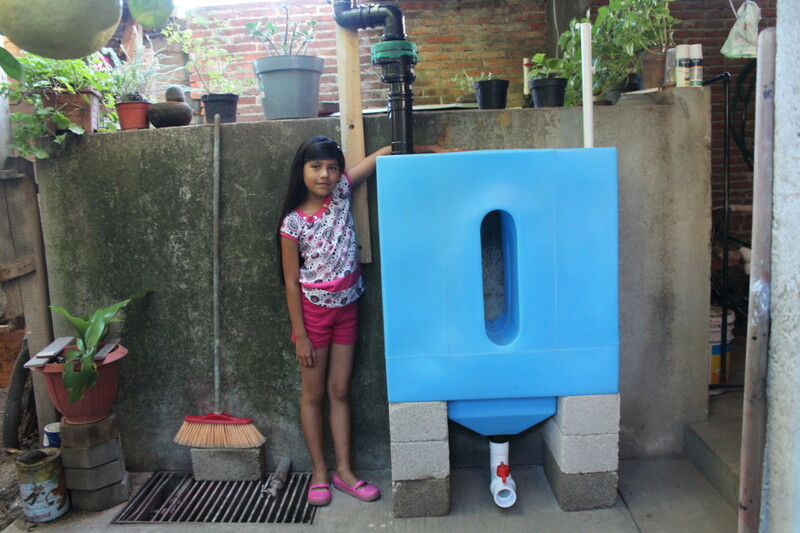 It could be said that our project is very special in this sense, thinking about the water problems that face Mexico City. It’s a monstrous undertaking that would scare anyone. But when you can think up a solution, although it may be small, this can set off a chain reaction to something much bigger and much greater in the future.